Maybe this is my silly season, but I can’t help thinking there must be something more important for me to write about than the first official photographs of Prince George. If there is, it’ll have to wait because for some reason I can’t let these images pass without comment. Of course I’m not alone. There has been quite a bit of justifiable criticism of the photos which were taken by Kate’s father. I’m not a fan of the stagey Royal shots which are often presented to us, all glitz and kitsch, and I can understand why the Royals are trying to be more “of the people”, but I can’t help feeling Michael Middleton isn’t familiar enough with his camera or photography in general to pull this off convincingly. It takes a reasonable amount of skill to make an un-staged photo still look like a good photo. In a spirit of generosity, I’ll give Mr Middleton a few pointers for the next time he has to take a family group, or George’s sibling is born and official photos are required again (apart from finding a decent photographer, for which I’d charge only a reasonable fee and expenses). The sun being behind the group, the lawn and other landscape features in the background have become washed out. Not always a problem, but it doesn’t work in this context. Bleached-out skies aren’t attractive. Tied in with 1, the camera sensor can’t cope with the deep shadow in Kate and William’s faces. They too look washy and lack detail, this time by being too dark. The problem is probably made worse by using a cheap lens. It would take a fair bit of Photoshop fiddling to rescue the details. A better option would have been a reflector or flash. Nothing fancy, just a small flash would have helped balance up the contrast between faces and background and brought out more detail. An ugly splash of light on William’s head. Moving the couple into a shadier area, or turning them would have helped 1 and 2 and avoided ugly highlights like this one. I only know that’s a dog because I’ve read the caption. It looks like an abandoned rug and adds nothing to the photo. 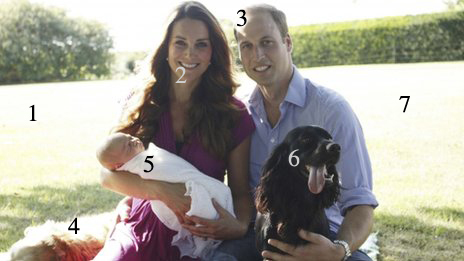 The baby, perhaps the most critical element of the photo, takes up less of the photo than 6, a dog. The main purpose of the photo is the baby, but he’s lost here in a sea of distractions. A black dog, unlit, with its tongue lolling out. Just another distraction. I could have put this number in so many places on the photo – there is so much wasted space. Take out the dogs, turn the camera vertical and focus in on parents and baby. A bit of garden in the background to give some context and location and the job’s a good un. Well even if Michael Middleton ignores my advice, you’re welcome to use it next time you need to take an “official” photo of your family. I was thinking a lot of the same thoughts. I have heard that Kate is good with photos and has an eye for it, this image tells me she doesn’t. If she does, she didn’t get that talent from her father. I wouldn’t knock his right to take his own photos, but to release them as official portraits seems to be overreaching their quality. Interesting comments and constructive criticism. I can see what you are saying and even me (as someone learning photography) would have focused much more on them and the baby then just leaving them in a sort of ‘unattended’ position. I cannot imagine these being the official photos though?! Thank you for your comments. I think the problem is that these have been indeed been released as “official”. We’ll see if anything else is released soon, but these may well be the only ones for a while. Again a professional photographer that can’t stand an “amateur” beating them at their own game. Gee! 🙂 Also, they want to show how normal, down to earth they are. The only thing missing was that they posted this on Instagram, of course, with a #nofilter tag, because they’re real. It does help that Kate is very photogenic and that they know by now how to pose for a photo without much guidance. The dogs, on the other hand, need a little more training. At that baby, he could at least keep his eyes open! oh well… The version on the BBC website has been enhanced – hue, saturation, some detail recovered. Where will we be withouth photoshop? I know, but it doesn’t bother me so much as I don’t do family portraits 😀 That’s why I don’t mind giving away “trade secrets” on this occasion! wouldnt exactly call them trade secrets as every decent professional they would be second nature. [moving discreetly my response to proper slot] You already lost them with the “I don’t do pets” notice. You already lost them with the “I don’t do pets” notice. I can’t reply to the “proper” slot, but anyway… I see your point. Oh well, I don’t want to be seen as a jack of all trades so I have to live with the fact I won’t win Royal commissions!